English horologist, the son of a carpenter, and born at Faulby, near Pontefract in Yorkshire, in the year 1693. From there his father and family removed in 1700 to Barrow in Lincolnshire. Young Harrison at first learned his father's trade, and worked at it for several years, at the same time occasionally making a little money by land-measuring and surveying. The bent of his mind, however, was towards mechanical pursuits. In 1715 he made a clock with wooden wheels, which is in the patent museum at South Kensington, and in 1726 he devised his ingenious "gridiron pendulum", which maintains its length unaltered in spite of variations of temperature. Another invention of his was a recoil clock escapement in which friction was reduced to a minimum, and he was the first to employ the commonly used and effective form of "going ratchet", which is a spring arrangement for keeping the timepiece going at its usual rate during the interval of being wound up. In Harrison's time the British government had become fully alive to the necessity of determining more accurately the longitude at sea. For this purpose they passed an act in 1713 offering rewards of £10,000, £15,000 and £20,000 to any who should construct chronometers that would determine the longitude within 60, 40 and 30 miles respectively. 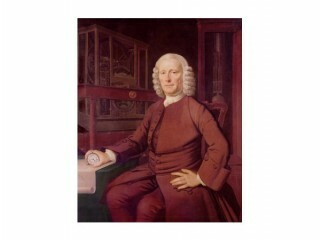 Harrison applied himself vigorously to the task, and in 1735 went to the Board of Longitude with a watch which he also showed to Edmund Halley, George Graham and others. Through their influence he was allowed to proceed in a king's ship to Lisbon to test it; and the result was so satisfactory that he was paid £500 to carry out further improvements. Harrison worked at the subject with the utmost perseverance, and, after making several watches, went up to London in 1761 with one which he considered almost perfect. His son William was sent on a voyage to Jamaica to test it; and, on his return to Portsmouth in 1762, it was found to have lost only 1 minute 54 and one-half seconds. This was surprisingly accurate, as it determined the longitude within 18 miles, and Harrison claimed the full reward of £20,000; but though from time to time he received sums on account, it was not until 1773 that he was paid in full. In these watches compensation for changes of temperature was applied for the first time by means of a "compensation-curb", designed to alter the effective length of the balance-spring in proportion to the expansion or contraction caused by variations of temperature. Harrison died in London on the 24th of March 1776. His want of early education was felt by him greatly throughout life. He was unfortunately never able to express his ideas clearly in writing, although in conversation he could give a very precise and exact account of his many intricate mechanical contrivances. View the full website biography of John Harrison.